The third part here of three pieces hopefully articulating why I do a lot of work in early years, why I believe that is important, how it works in practice and in this part, what are the risks and how are they managed. I of course am happy to discuss any or all of the issues raised here and can be reached by email here, Twitter & Facebook. Lets answer that question in the head line – None! The starting point here is the acceptance that being a child outside is going to result in the occasional bump, scrape, bruise or cut. It just is. Children everywhere will fall over and graze a knee on a busy high street, get a carpet burn at home, or stub a toe on the door frame. And as for standing barefoot on a piece of lego… say no more. More often than not society subjects the children in our care to what WE are afraid of in terms of risk perception which in turn has led to children becoming more and more solitary and sedentary as mentioned in Part 1. To be clear we do not want to see our own children or the children in our care get hurt at all, but it is going to happen to them at some time, in varying degrees of severity some how, so its vital we help to equip them to manage those situations when they happen, regardless of if that event is on our watch or not as professionals. Part of that equipping is to instill the skill at spotting and then managing a risk. Those of us of a certain age will remember videos like this (and far worse… Google ‘Apache Safety Film’ then sit behind sofa at your leisure peeking occasionally at the screen). Where I got that line from I am afraid is lost in the mists of time, but there are endless good sources of information and justification from academics, advisory bodies,government around the world and other teachers/early years professionals all extolling the virtue of risky play. Perhaps the phrasing is part of the problem? Use of the word risk is inherently loaded with negativity I think. I prefer the term “adventurous play”, it certainly sounds exciting! Woah. Heavy stuff. Now clearly my planned 2019 “EYFS Everest Expedition” may now have to wait indefinitely, but we must recognise our children from a very young age climb several ‘Everest’s’ worth of risk as they grow older, from leaving the hospital in the arms of new parents who could well be terrified of their new status, to learning to walk or using cutlery and simple tools like scissors, through to riding a bike and learning to drive. Taking risks is a natural process and wrapping up our charges in cotton wool does not help them learn how to manage those risks at all. That risk management may be as simple as holding their hand out so you might take it to assist their balance. It could be more sophisticated, such as a four year old asking why they have to wear a helmet before climbing or riding that bike. This is all helping our youngsters learn about risk. The outdoors is a great environment to facilitate that learning journey and have an adventure. So what are the risks and most importantly are they worth it? This ultimately is the question we must pose to determine if the play is to go ahead. 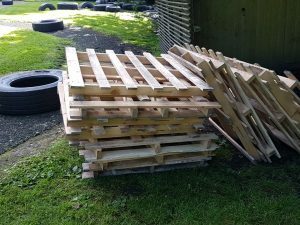 If the risk is a splinter or a small scrape, but the outcome is hours of imaginatively driven physical play such as with pallets, then to my mind it is worth taking. We can remove or bang in protruding nails, sand down excessively rough edges, use only soft wood pallets etc to help reduce the chance of that scrape further. But if they did then get a scrape – is it really that bad? Show me the four year old that doesn’t respond to some TLC and if you are desperate a smiley face/superhero placebo plaster. More often than not I believe it is our fear of their reaction, or indeed our reaction to that event that causes more stress and upset in the child than the event itself. Best nursery play things ever. Fact. It is essential that children learn that their actions have real results and consequences. I am sure most of us can think of an adult or two who could benefit from some revision in that area! In the real world, young children are capable of assessing many of their own day-to-day risks, for instance if you asked a three year old to drop a hammer on their toe – they would likely give you a funny look and flatly refuse. However they must have the chance to learn and practice that type of risk management. Only if they’re well versed in critical thinking and not the habits that blind obedience creates can they achieve what to us is logical thought – which it isn’t! It is our experience at risk management that tells us not to drop heavy tools on our feet. Children need to learn that too. The parent who shouts, “Don’t slide down the stairs!” might well be keeping a child safe in that split second, but is also, at the same time, robbing them of a chance to think for themselves, which makes that child that much less safe in the future when no one is there to tell him or her what to do. How about we offer the facts (“If you slide down those stairs you might get hurt.”) and let them practice thinking things through, to consider the possible consequences of their actions, to assess his own risks, to ask herself, “Is this a risk worth taking?” or “Could I do this differently” (For the record, if it is my son you are asking this of, he will just smile at you and slide down the stairs having decided the risk is worth taking – he just might not do it head first!). What about the zip lines, the climbing, etcetera? Well again in the climbing world the cliche line is usually ‘you are more likely to get hurt in the car on the way to or from the crag than at the crag itself’. This really is that simple, all the equipment used is fit for purpose, used in the appropriate context by someone (me!) with the National Governing Body recognised skills to be able to use that equipment appropriately. For those that don’t know, climbing ropes are strong enough to lift a car/small van. They simply do not break in normal context of use. Where there has been recorded incident is usually down to either a knot being incorrectly tied or the rope was cut over a sharp rock edge or a damaged karabiner or was exposed to corrosive chemicals and subsequently failed. Three instances that as a climber I check for each time I use that equipment in line with my training, my own due diligence, insurance requirements, common sense and desire to keep doing a job I love. Five pretty powerful motivators! Using this equipment in a Nursery’s garden, where I have yet to come across acid bathed sharp rocks is out of the equipment’s usual context for sure, but one could very easily argue it is a safer one! That said please be assured if ever I do spot acid covered sharp rocks in your setting whilst I do a site visit and risk assessment I will be sure to avoid them and let you know…. As for the knots, I keep it simple and recognisable – Figures 8’s, Bowlines, Hitches and double check each one before using the set up as planned or as if I were climbing myself. All of these activities whilst certainly containing a ‘risk’ (which is managed) do I believe present the perception that the risk is at a higher likelihood than it actually is, or at a comparably higher chance than an actual risk in ‘everyday normal life’ so to speak. This makes those activities great tools for helping to teach children about risk management, help them learn to manage those emotions such as anxiety or fear and most importantly overcome them. 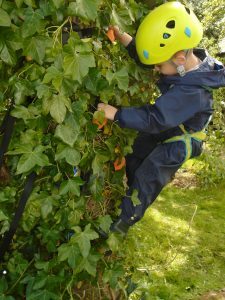 Something I say quite often to older children – 8-9 upwards on residential courses or adventure days at various centres, when they are all to conscious of a perceived risk and the fear sets in before a leap of faith, or climbing activity is that their staff haven’t brought them here to hurt them. That’s far more easily done with less paperwork in school! That all the equipment is safe, tested, countless children before them have done this, I’ve done this and many more children will do it after them. I offer this to help them begin to rationalise that perception of risk which has caused fear and anxiety. After all, it is natural to be fearful of some instances and certain situations but I believe strongly it is our job to help those children learn to overcome those fears for themselves, manage those risks for themselves, pick themselves up and try again having learnt from the experience so their comfort zone, or sphere of experience grows bigger and faces outward rather than shrinks and cowers inward. Our role is simply to eliminate hazards which they may not see and then to let them take us on their own learning adventure. Which I think concludes things nicely. Drop me a note on social media to let me know your thoughts on this and some of the other matters I have raised in these three commentaries.